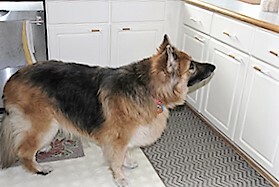 She’s a sweet, well-mannered, almost blind, now 9-1/2 year-old Shiloh Shepard we adopted two years ago. At the time we didn’t know two things: She’s going blind and she has, in our veterinarian’s direct turn of phrase, s****y nails. We’ve all adapted to the blindness for the most part. But the nails. She’s at the animal hospital right now having yet another cauterization on a badly broken nail. At least I hope that’s where it stops. One bad infection last summer required surgery and a couple of weeks in a bandage. Our ongoing quest is to find a way to make her nails strong enough to withstand a daily walk as part of a good dog life. As I noted earlier, we’re trying soy milk. Coincidentally, today I read an article on a hand model’s regimen in the New York Times. Imagine the veterinarian’s face when I ask about adding a sulfur supplement. Liza won’t mind another pill; her vitamins are first swiped in butter then wrapped in bread. And hopefully neither her nails or the budget will break for a bit longer.